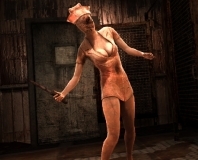 Silent Hill games have always relied on horror clichés: the pitter-patter of unseen children’s footsteps, whispered nursery rhymes, self-propelled rocking chairs – that sort of thing. The latest entry to the franchise, Silent Hill: Downpour, adds a dash of infanticide and a hint of paedophilia to the mix, creating a morbid mish-mash of modern horror conventions. If you’re a fan of these conventions and like the idea of chasing ghostly little girls through abandoned orphanages, performing ad-hoc autopsies on barely-dead corpses and battling wheelchair bound demons, then you’re in luck because that’s what Downpour does best. Unfortunately, like most Silent Hill games, a tolerance for confusing level design, fiddly combat and the occasional barely logical puzzle is also required. Downpour wastes no time setting a gruesome tone. As prisoner, Murphy Pendleton, your first task is to shank another convict. The victim is completely defenceless, dressed only in a towel and pleading for mercy. Forcing players to murder an unarmed, semi-naked man right off the bat is an extreme way to do it, but does instantly get you thinking about Pendleton, who he is and how you’re supposed to feel about him. 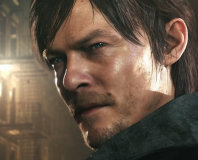 Questions about Pendleton and his past are put on hold when the bus transferring him to another prison crashes on the outskirts of Silent Hill. Seeing a chance to escape, Pendleton makes his way towards town, and it’s not long before he’s attacked. Spades, pickaxes and most objects lying around can be used as melee weapons, with one button for block and another for attack. Arkham City proves combat doesn’t need to be complex to be rewarding, but some kind of depth is needed. Fights in Downpour are basically just: block, strike, rinse and repeat. And that’s it. Things get worse with multiple enemies. Pendleton automatically locks onto whatever’s in front of him making it hard to choose targets, while holding block roots makes him stationary and therefore vulnerable to attacks from behind. Fighting in tight spots is even more awkward, sending the camera into spasms as Pendleton pirouettes to face his attackers. Melee weapons deteriorate with use, so a pickaxe will lose its spike, becoming a long stick and then a shorter stick before breaking entirely. Having no way to tell the current state of a weapon is annoying as scraps are often interrupted with searches for replacements. A pistol and later a shotgun make killing things easier, despite jittery aiming. But ammunition is low, so best saved for times where an area has to be cleared to continue. Thankfully this doesn’t happen often and most of the time you can - in true Silent Hill fashion - just leg it when you see enemies. Silent Hill itself is fairly large with plenty of side missions, a lot of which are easy to miss. A combination of fog outside and dark areas inside make missing things a regular occurrence. We finished a few side missions and seemingly impossible puzzles by walking the perimeter of an area, lighter in hand, waiting for a ‘pick up item’ button prompt to appear. Bizarre logic and the [slightly] non-linear level design can also make puzzles trickier than they are probably intended to be. Pendleton sometimes spouts supposedly helpful comments, but these exclamations are mostly reserved for the blindingly obvious, like saying: ‘This is a ticket machine,’ while standing in front of a ticket machine. Some puzzles are inventive, incorporating the environment in different ways and in one memorable instance transforming it entirely. Downpour’s trippy moments provide some of the best set-pieces, using a combination of dream logic and horror film scare tactics. One features a strobe-lit mannequin army edging forwards between flashes with a nightmarish quality perceptible even to our poor, desensitised brains. In general, Downpour’s presentation is slick, helped by the lack of a HUD. Pendleton’s health is gauged by his appearance, with blood patches, cuts and a worsening limp as visual indicators. It’s hard to know exactly how much of a beating Pendleton can take before dying but a regular supply of first-aid kits means it’s not a problem. Interior environments look suitably grimy, thanks to crumbling walls, dripping ceilings and rusty bed frames. Smoke, particle and fog effects are all impressive too, signaling the end of the days when Silent Hill’s misty weather was mainly used to limit draw distance and provide cheap scares. In Downpour the thunderstorms do a commendable job of adding to the town’s eerie atmosphere. Gentle drizzle turns into sheets of rain, followed by booming thunder and bright lightning that bathes the world in a brief electric blue glow. Although a lengthy, mandatory install is required [on PS3] there are still technical issues. The framerate is schizophrenic, dropping frames at calm moments, yet remaining smooth during intense action scenes. It also takes a prolonged hit whenever saving, awarding trophies, or entering certain areas. Clipping is also frequent; the weapons Pendleton holds spend as much time in walls as out of them. From an audio standpoint, Downpour is exceptional. The score, by Dexter composer Daniel Licht, is appropriately creepy, building tension, discomfort and even a touch of the ethereal, using screechy, unnatural sounds, pounding industrial beats and recorded songs. A decent 5.1 setup makes jumpy sections even more unnerving. The story is as convoluted and silly as expected from a Silent Hill game, but importantly, it’s enjoyably intriguing. After the prison prologue it takes a while until more is revealed about Pendleton, but once it gets going Downpour’s story becomes one of the main draws to continue playing, despite the flaws found in the rest of the game. So, whether you enjoy Downpour or not is determined entirely by your willingness to overlook its flaws, suspend disbelief and allow yourself to get drawn into the strange world of Silent Hill. Though we’ve pointed out many problems with the game, none of these issues ruin the experience, and crucially, it’s still fun to play. Downpour is clearly nowhere near as good as Silent Hill 2 or 3, but fans of horror games should definitely give it a try. 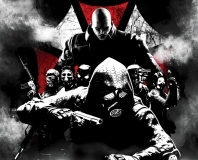 What do you get if you cross Resident Evil with a team-based shooter? This.